Two nights stay in in the unique setting of Inis Maan Aran Islands. The island is the middle of the three Aran Islands, it is the most peaceful of the three islands which lends itself to a relaxing and rejuvenating stay. 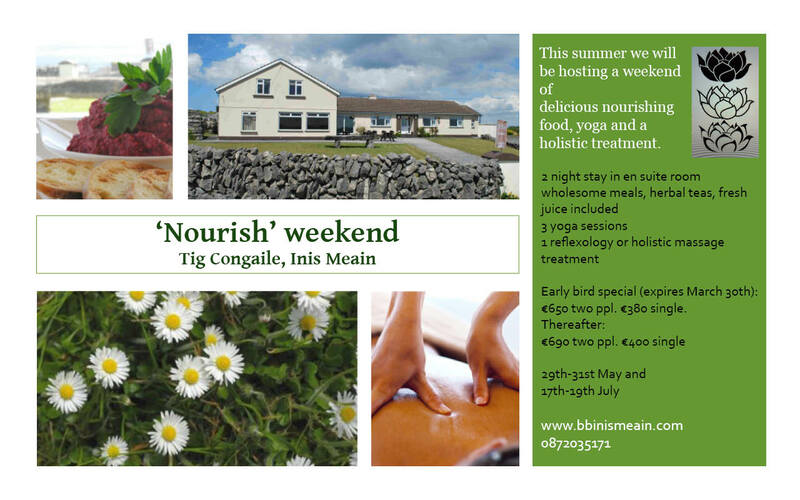 The weekend will be a holistic event based on nourishing the body, mind and soul. All the food will be prepared by Vilma the well- known Guatemalan chef and proprietor of Tig Conghaile the BandB and restaurant where the weekend will be set . The rooms are all en-suite. The food will be all made in house using as many nutritious local ingredients as possible. The location looks out onto the Atlantic with stunning views of the cliffs of Moher. On Saturday and Sunday there will be yoga which will be led by Lisa and John two wonderful Galway based yoga instructors who teach vinyasa synergy yoga which is a safe, strength building and energising style of yoga. Also included in the weekend is one treatment of either a holistic massage or reflexology. The treatments will be provided by excellent ITEC qualified holistic therapists. The benefits of massage and reflexology are both excellent treatments for both relaxing and detoxifying the body. Arrive on the evening ferry www.aranislandferries.com/ The boat departs from Ros a´Mhíl and a bus can be boarded from Galway city to take you directly to the boat. Morning detox juice, morning yoga, breakfast, enjoy a stroll or a quick dip in the sea at the beach which is 5 minute walk from the property, lunch before getting ready to depart on the afternoon ferry.